Go-Ferm Protect Evolution® is a natural yeast rehydration nutrient developed specifically for problem musts and stuck fermentations. It is OMRI listed. Difficult fermentation conditions may include overripe fruit (>28°B), marginal fruit quality (poorly developed fruit, Botrytis, rot, high bacteria count, insecticide or fungicide residue), low nutrient levels and overclarified juice. 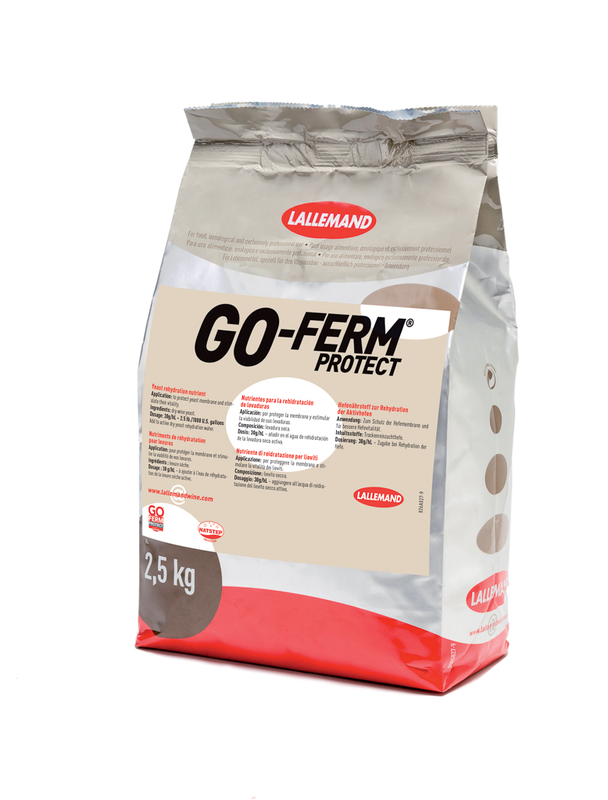 Go-Ferm Protect is the result of a multi-year study of problem fermentations by Lallemand and National Agricultural Research Institute (INRA) in France. Their scientists found that in problem musts deficiencies in sterols and polyunsaturated fatty acids can leave yeast susceptible to osmotic shock, ethanol toxicity, temperature and other stress factors. The NATSTEPTM (NATural STErol Protection) process was designed to meet these fermentation challenges. Go-Ferm Protect incorporates sterols and polyunsaturated fatty acids (for cell protection) together with vitamins and minerals to help ensure yeast survival and to help maintain fermentation activity to completion. Go-Ferm Protect provides a combination of protective and nutritive benefits for optimal fermentation results. To Use: Mix Go-Ferm Protect in 20 times its weight in clean 43°C (110°F) water. For every 1 kg (2.2 lb) Go-Ferm Protect, use approximately 5 gallons of water. Let the mixture cool to 40°C (104°F) then add the active dried yeast. Let stand for 20 minutes. Slowly (over 5 minutes) add equal amounts of must (juice) to be fermented to the yeast slurry. Watch the temperature. Do not allow more than 10°C (18°F) difference between the must (juice) and the yeast slurry. Atemperate as necessary. Storage: Dated expiration. Store at 18°C (65°F). Once opened, keep tightly sealed and dry.